Summary HomePlug AV compatible 500 Mbps powerline adapter kit based on QCA AR1500/AR7400 chipset. Small(er) seems to be the latest attempt to differentiate powerline adapters that are largely cut from the same cloth (or chipset). TRENDnet recently announced its TPL-406E 500 Mbps Compact Powerline AV Adapter that has a footprint smaller than 3" x 2". Actiontec has also added a similarly-sized and featured PWR500. 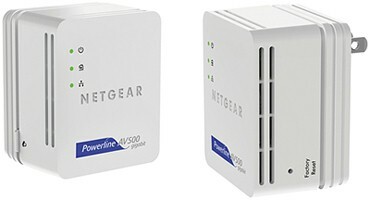 But this review will look at NETGEAR's version of a compact 500 Mbps powerline adapter. As its name implies, the XAVB5101 Powerline Nano 500 set includes two XAV5101 adapters, which don't appear to also be available as individual adapters. The HomePlug Certified Products database shows the individual adapter as Homeplug AV Certified and the product box displays the HomePlug AV Certification logo. Unlike the Actiontec and TRENDnet adapters mentioned above, the XAV5101 has a 10/100/1000 Ethernet port, like the larger adapters in last fall's Home AV 500 Roundup. The label on the adapter shows a 100 - 240 VAC rating, something that is not found in its website description or data sheet. The diagram below shows the usual Power, Ethernet and Powerline lights. The "Pick-a-Plug" LED called out below means that the powerline indicator changes color to indicate link quality. The adapter really is smaller than the now-discontinued XAV5001 that it replaces, as shown in the photo below. Both adapters are designed so that they don't block the other outlet in a duplex socket. The XAV5001 on the top measures 3.4" x 2.6" x 1.6"; the XAV5101 on the bottom is 2.6" x 2.2" x 1.7". The small size seems to have one downside—the adapters run fairly hot. Not fry-an-egg-on-em hot. But toasty enough that you would notice. I was able to open the adapter to take the shot below. The two halves are joined via the connectors seen at the lower left and right of each section. The half on the left holds the AC prongs, power supply and powerline interface circuitry, while the half on the right is where the powerline magic happens. The boards are nailed down pretty tightly. But I figured I could get a chipset ID by firing up the powerline utility that came with the XAV5001 (none is available for the XAV5101). Although the NETGEAR utility detected the adapter, it identified it as "unknown". So I tried D-Link's simpler utility that confirmed the Qualcomm/Atheros (QCA) AR1500/AR7400 powerline chipset that I suspected. While the utility didn't call it out, I suspect that a QCA AR8021 Gigabit Ethernet PHY and 16 MB of RAM are also in there somewhere, as they were in the XAV5001 and all other 500 Mbps "AV" adapters I've seen. Because there is no utility provided, there are no settings that you can adjust. If you want to privately pair two or more adapters, you use the Security button and follow the instructions in the printed Installation Guide that comes with the set. I tested the paired adapters at three locations in my home using this procedure, running separate up and downlink tests at each location. I also ran simultaneous up/downlink and four-stream tests at Location A. All results have been entered into the Powerline Performance Charts database. The chart below shows average uplink throughput for all three test locations for all 500 Mbps powerline adapters I've tested. There isn't a simple 200/500 filter in the Powerline Charts, so I created the chart using the Powerline Product Finder. I just set the Features > Maximum Link Rate filter to 500, then ticked the Uplink Throughput Compare Performance checkbox for all the products shown, then hit the [Compare Performance] link. And here is the downlink chart. The XAV5101 really outdistances the pack on uplink, but not for downlink. A look at the throughput vs. location plot below shows that this is mainly due to the 216 Mbps throughput measured in the Location A (same outlet) test. Same-outlet tests sometimes risk getting lower than normal results due to signal overload. But the XAV5101 appears to not have this problem. For downlink, the XAV5101's throughput is only about 8% higher than the next-best adapters in Location A and has about the same throughput as other products at the other two test locations. Adding a second pair didn't find much more throughput, but it sure showed unequal throughput distribution among test streams! I again ran a test with the two computers connected via Gigabit switch and found similar behavior. I upgraded to the latest drivers and tried changing various settings in the Intel Ethernet adapter properties, but could not eliminate this behavior. I did find, however, if I dialed back the test script send rate so that total throughput did not exceed 1 Gbps that throughput divided equally and was rock-steady. Since the larger XAV5001 has been discontinued, the XAV5101 (or more accurately, the XAVB5101 kit) is it, if you want to buy your 500 Mbps HomePlug AV adapters from NETGEAR and don't want outlets on them. NETGEAR's site also shows an XAVB5201 that's "coming soon". But I can't tell what the difference might be from the XAVB5101. At any rate, I wouldn't buy the XAVB5101 simply because of its high uplink Location A performance. After all, who is going to use two powerline adapters plugged into the same outlet? If you set that result aside, the XAVB5101 looks like it will behave like all the other "AV 500" adapters on the market.